Please note that as of March 2016, the Capital Spreads platform is no longer available. However, if you liked your Capital Spreads account, or were interested in opening a Capital Spreads account, then the FinancialSpreads.com is a very similar alternative. 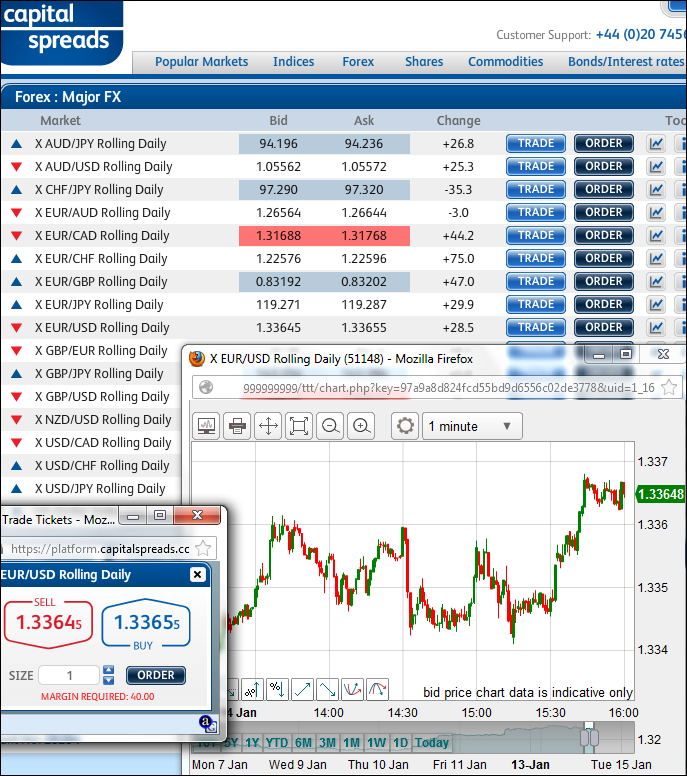 FinancialSpreads.com uses a platform with a similar layout, similar or better prices, they offer 1,000+ markets etc. Likewise, InterTrader also offers a similar platform. What Happened to Capital Spreads? In 2016 Capital Spreads was merged into ‘LCG Trader’, a new and somewhat different platform. Given that LCG Trader is a new platform we don’t have enough views to give ‘LCG Trader’ the thumbs up / thumbs down. Any feedback is welcome. New Spread Betting, CFD and Forex Account? 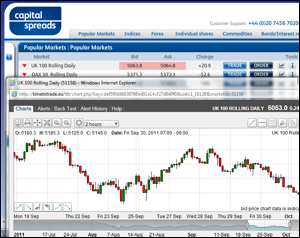 As well as the above, please also see our see our spread betting, CFD and forex offers and spread betting comparison. Note that the Capital Spreads information below is no longer accurate, it is maintained purely as part of the CleanFinancial Website Archive. Capital Spreads have won a number of the more prestigious industry awards. Add Your View – please add any user comments and/or questions on Capital Spreads here. In addition to a comprehensive financial spread betting service, Capital Spreads offers contracts for difference (CFDs) on shares, forex, indices and commodities. Like spread betting, CFD trading is leveraged, so an investor does not take a stake in the underlying market and they do not put up the full value of the shares that they are buying or selling. With CFD trading the primary trading costs are normally the commission and the spread, i.e. the difference between the sell and buy price. As such it normally costs more to trade with companies that have wide spreads and high commission levels. If you trade CFDs with Capital Spreads there are no commissions. They also offer some of the tightest spreads in the market place. E.g. the spread applied to FTSE 100 shares is just 0.05% per side of the underlying market. Note that CFD trading and spread betting carry a high level of risk to your capital and it’s possible to lose more than your initial investment. A variety of intervals, e.g. tick, 1 minute, 2 minute, 10 minute, 1 hour, 4 hour, 1 day, 1 week, etc. Important chart overlays e.g. EMA, MA, Ichimoku Kinko Hyo, Price Channels etc. 30+ indicator charts e.g. Historical Volatility, Money Flow, Forecast Oscillator, Range Indicator, Price & Volume Trend, etc. Below, readers will find a sample of the markets offered by Capital Spreads along with their typical in-hours spread size and the minimum stake for that market. See the Capital Spreads website for full details. Plus other index markets like: AEX Index, Swiss SMI, Indian Nifty 50 etc. Plus markets such as: Natural Gas Futures, Silver Futures, Copper Futures, Coffee Futures etc. 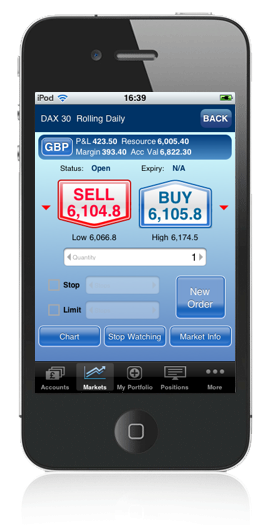 There are also markets such as: CHF/JPY, EUR/NOK, NZD/CAD, USD/MXN etc. Also see comparison / company spreads notes. “CapitalSpreads.com is an exciting contender in the financial spread betting market-place and we hope it will be embraced by both experienced customers and newcomers to the spread betting world. “We have built our business with the sole purpose of introducing competitive pricing and a customer friendly trading environment. “Our unique account management system ensures that you can trade with confidence and the knowledge that all your positions are protected by our automated stop loss facility which can help to limit the risk on your spread betting account (stop-losses are not guaranteed). “This client protection policy underlines everything that makes us the choice for many private investors and professionals alike. We are truly aiming for every CapitalSpreads.com trade to be as stress and error free as is possible. “We are committed to quoting amongst the best prices in the industry and feel certain that this, coupled with our customer service policy, will keep you coming back for more. Capital Spreads is a division of London Capital Group (LCG). LCG is a company registered in England and Wales under registered number: 3218125. London Capital Group Ltd, a wholly owned trading subsidiary of LCGH plc, is regulated and authorised by the Financial Conduct Authority. It has a European passport and is a member of the London Stock Exchange. London Capital Group Ltd also has access to international markets through its global clearing relationships. Registered address: 2nd floor, 6 Devonshire Square, London, EC2M 4AB. We find the Capital Spreads platform to be fairly intuitive. However, below, we have also added a series of videos focused on the platform to help those less familiar with financial spread betting and/or the Capital Spreads platform. The following video looks at how spread betting works, the types of markets and the margin requirements as well as rolling contracts and futures contracts. The following video looks at the tight spreads, low margins, limited risk orders, stop loss orders, demo accounts and educational tools available on the platform. The video below reviews the markets available, 24 hour trading, leveraged trading, tax-free* trading, commission-free trading, no brokerage fees, trading falling markets, segregated funds and of course, the risk to your capital. Other Financial Spread Betting Companies? For a price comparison see Spread Betting Companies Comparison.